Inflectra is a privately held software company dedicated to helping our customers - large corporations, small businesses, professional services firms, government agencies and individual developers – with the means to effectively and affordably manage their software development lifecycles, so as to decrease the time to market and increase return on investment. We are headquartered in the growing technology community of Silver Spring, Maryland located just outside Washington, D.C.
Spiratest has been in the market since 2007, trying to provide an integrated set of tools for managing the testing lifecycle. It was the first solution that brought usability, powerful reporting, dashboards and traceability to everyone. It has emerged as a simple, yet sturdy solution for critical industries like Aerospace, Healthcare and Banking services. Spiratest is not just limited to issue and bug tracking, but also optimizes user experience, vital for any project success. It is a complete quality assurance and test management system with integrated release scheduling and defect tracking, requirements traceability and real-time coverage analysis. Inflectra® is pleased to announce the release of Rapise 5.0, the latest version of its Rapise test automation platform. Rapise is the most comprehensive and powerful automated testing solution on the market. With its latest version, Rapise offers testers a single platform to test web, mobile and desktop applications as well as web service APIs. One of the key enhancements in v5.1 of Spira is the use of SQL Server free text indexing to provide a completely new search experience. 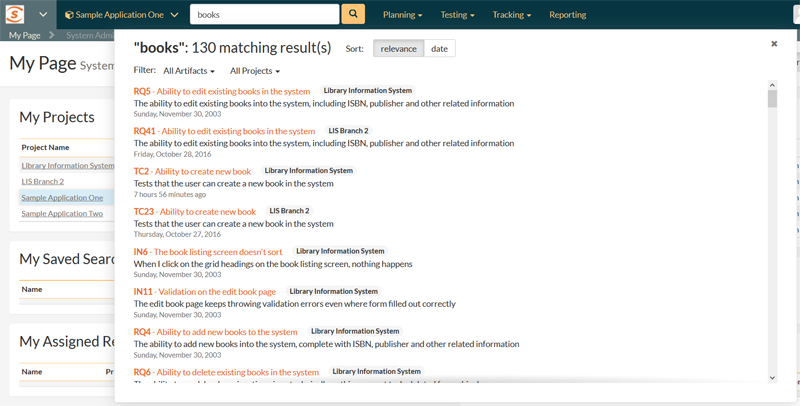 The new search capabilities in Spira 5.1 are a dramatic improvement over the previous version. Inflectra® is pleased to announce the release of SpiraTeam 5.0, the latest version of its award winning application lifecycle management (ALM) suite. The latest version of SpiraTeam empowers software teams everywhere. It provides a powerful and elegant platform for developers, testers, project managers, and end users to collaborate, and create. SpiraTeam 5’s brand new user interface is designed from the ground up to be fully mobile responsive, cementing Inflectra’s vision of ‘Spira Everywhere’. Inflectra announce the release of SpiraTest , SpiraPlan and SpiraTeam, the latest version of their award-winning requirements management, test management and agile project-planning ALM suite. The new version features a completely redesigned interface that allows the whole application to be used seamlessly on all mobile and desktop devices, a new test execution wizard as well as support for test case/release workflows and digital signatures. We are pleased to announce the release of an updated plugin for SpiraTest,SpiraTeam and RemoteLaunch that integrates with NeoLoad from Neotys and provides enhanced load testing integration and SLA reporting. We are pleased to announce the release of Rapise v2.0 that provides support for testing HTML5 applications, data-driven testing using ODBC databases as well as support for advanced AJAX web applications using the GWTExt and SmartGWT frameworks. We are pleased to announce the release of SpiraTest, SpiraPlan and SpiraTeam v4.1. This new version includes support for requirement workflows, task workflows, use cases, as well as improved agile planning and requirements/task management. In addition, it introduces an integrated instant messenger. We are pleased to announce the release of RemoteLaunchX(tm), the new cross-platform version ofRemoteLaunch(r). This new version of the system is written 100% in Java and can be used on different environments including: Linux, UNIX, MacOS X and Windows. This new version is available at no charge to all existing RemoteLaunch customers. RemoteLaunchX(tm) includes support for existing command-line applications on different platforms and reporting the results automatically back into either SpiraTest or SpiraTeam. The system allows testers to specify custom regular expressions for parsing the output of automated test frameworks to more accurately determine the execution status and outcome. 2013-06-27 We are pleased to announce the latest release of Rapise, our automated GUI, web service and cross-browser testing solution. The new release includes support for testing RESTful web service APIs, support for IE10, as well as new libraries for the GWT-Ext and SmartGWT versions of the Google Web Framework. This new version provides the ability to test applications written using Java SWT and Microsoft Silverlight. It also provides enhanced support for Windows Presentation Framework (WPF) and Firefox/Chrome web browsers.